While J and I wait for our trailer to be completed, we are spending a lot of our time ordering our building materials. Our windows will be ready for pickup in a week or two and our new refrigerator will be delivered tomorrow. We finally made a decision sink-wise and settled on IKEA’s small farmhouse sink. 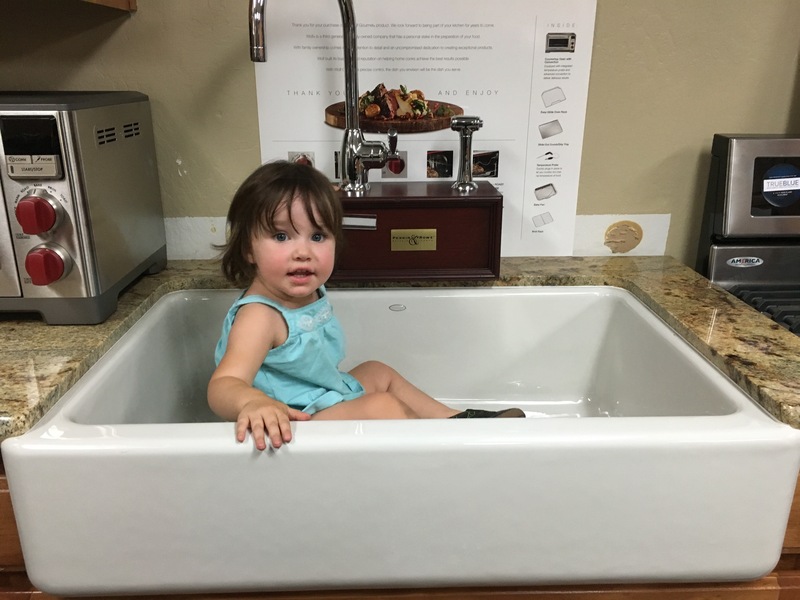 In the meantime, we had fun testing out as many farmhouse sinks as humanly possible! Way too big for a tiny house! 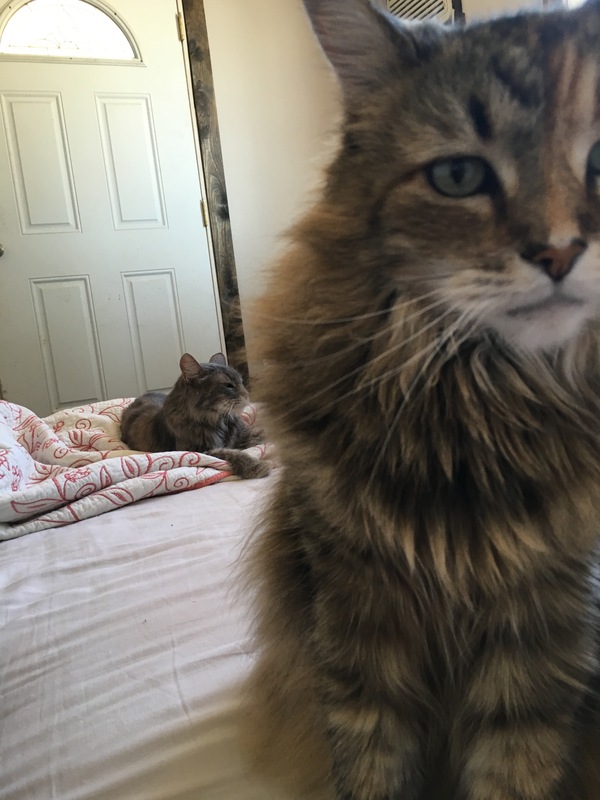 As worried as we were about Kitty and Tikka cohabiting peacefully in the tiny house, we were more worried about how they’d get along in the meantime in an 8×10′ bedroom. When we lived in the condo, Tikka’s domain was upstairs and Kitty ruled the roost downstairs. Even then with 1,000 square feet of space, we had cat fights daily. Needless to say, I was worried. Much to our surprise, our two cats who couldn’t tolerate living together before, can live (somewhat) peacefully together now. Granted, we still get the occasional hissing and Kitty can get grumpy if Tikka gets a little too close, but I am relieved that I haven’t unknowingly gotten in the middle of a cat fight at night. W is at home here in the country more than ever. She can forever be found outside, discovering toads and lizards and playing in the mud. You know you made the right decision for your family when you see your children happy. Planning a tiny home layout ain’t for the faint of heart, man. For over a year, J and I have been tossing tiny house ideas back and forth. We’ve discussed everything from how to maximize our storage space to what happens if we have another baby. You literally have to think of EVERYTHING. Some ideas we tucked away for later and others were instantly trashed. We’ve even thrown out ideas that we had previously liked but later realized were not doable. Planning a home design with your significant other is very trying. Nothing puts your marriage to the test as much as trying to convince your husband that you really, REALLY need a Dutch door when deep down you know it’s not in the budget (we compromised and decided to get one later on down the line). I want to clarify that when we were designing the tiny house, we went through handfuls of ideas. We even played around with the idea of purchasing plans from other tiny home builders, but in the end, we decided to draw our own because it allowed us to create the perfect space for our family. With our 24′ trailer, we were able to design our home with three sleeping spaces. W is still in bed with us, but once she’s ready to sleep on her own, we wanted her to have her own bedroom. Therefore, we will have our master loft upstairs, a bedroom big enough to fit a twin murphy bed downstairs and right above that, a twin sized loft. Our goal for W’s room is to have the murphy bed so when Mama needs some quiet time…I mean, when W wants to play, I can easily return her bed to the wall and she has the entire floor to play. The first level will also house the living area, kitchen and bathroom. I love to bake, so it was important to design a kitchen that had adequate counter space, plus an oven. Eventually we hope to acquire a washer/dryer combo, which will be housed in the kitchen. J lucked out and snagged a 9 foot piece of Quartz countertop from our neighbor for a steal ($50!) and that, along with a piece of butcherblock, will complete our countertops. The piece of butcherblock will also function as our cutting board and our dining area. Just pop a few stools around and call it good! The bathroom will be itty bitty but in such a small space, we have plans to install a shower (babies will be bathed sink style), a compost toilet and sink. And let me tell you, our sink is adorably itty bitty. Thank you IKEA! Barn doors will be used for the bathroom and W’s room. They will be perfect for getting some privacy without the added space a standard door takes up. For W’s door, rungs will be installed on the outside for easy access to the loft above and the bathroom door will be painted with chalkboard paint to allow little ones drawing space and Mama can also write grocery lists. And as much as I’d like to say that we’re set on the design, you never will know how things turn out during the building process until you’re doing them. Be prepared for change! Let me tell you, designing sure makes a gal tired! J and I celebrated our third wedding anniversary by taking a trip to a local trailer dealership and starting the paperwork on our tiny home trailer. Sure, dinner out at a fancy restaurant would have been nice, but J and I aren’t that type of couple. For our first anniversary, we drove to Moab, Utah to go off-roading (I was 9 weeks pregnant, no less!). Our second anniversary was spent at the beach. There may be nothing fancy about sitting at a dealership for 2 hours, but to me that signified the start of a new adventure for our little family. We decided to buy a new, custom built tiny home trailer because we could customize it to suit our needs and we had no qualms that it would be heavy duty enough to support a 10,000 lb tiny house. 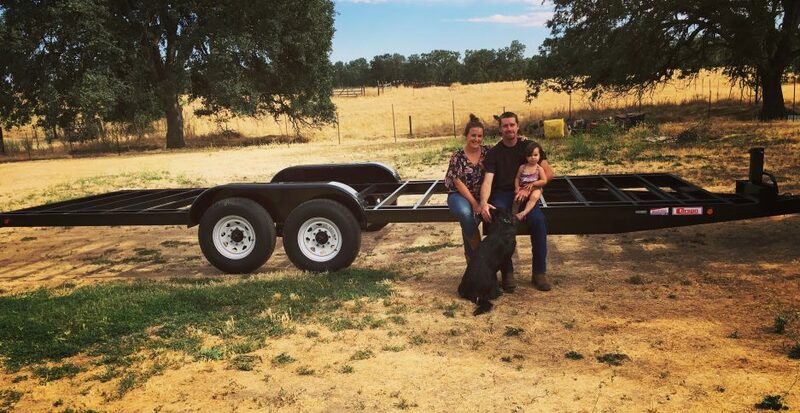 There is without a doubt that you can buy one used, which we certainly looked at, but we felt it was best for us to buy a brand new trailer that we knew was made specifically for supporting tiny homes. Imagine it with no rails, no wood and 6 feet longer and that’s our trailer! Our trailer is 24′ long and 99″ wide. When building tiny homes, you need to factor in that the materials (i.e. siding/shutters) add width to your house. If you buy the maximum width trailer, which is 102″, you are already at your max width and anything added to it will make your tiny home too wide and therefore it becomes an oversize load and you’d need a special permit to haul it. It is also crucial to note the weight rating on your axles. Our trailer is rated for 14,000 lbs. Our tiny home will be built to as close to 10,000 lbs as possible, but having it rated at 14,000 lbs means that we know the trailer won’t be stressed. The trailer is our tiny homes foundation and a strong foundation means a longer lasting home. Another detail we flip-flopped on was whether to get a drop down deck (which would give us an extra 4 inches, crucial in such a small space) or keep the standard 26″ deck. While that 4 inches was rather enticing, we went with the standard 26″, only because while the tiny house was being hauled, steep hills and bumps would be a hindrance. No one wants to have a 10,000 lb tiny house teeter-totter! Post condo, pre tiny house. Staying at the in-laws while we build. I remember reading somewhere that if you were entertaining the idea of going tiny, it would be a smart idea to try to slowly consolidate your living quarters into a smaller space, which meant essentially for us, moving downstairs. We lived in a condominium before going tiny. It was set up with the kitchen, living room, one bedroom and one bathroom downstairs and one bedroom and one bathroom connected to a small loft space upstairs. When our daughter was first born, her bedroom was downstairs and J and I were upstairs. But once we figured that tiny house was the direction that we were going to take, we figured it’d be best to try to live “smaller” and move into W’s room. After that, the 2nd story was deemed ‘off-limits’ and the only time I went up there was to organize my garage sale pile and feed one of the cats. Even with the downsizing we did, it still feels like we have too much stuff. That was one year ago and I can tell you that I haven’t felt the urge to move back up there since. Now, obviously, the tiny home is going to be considerably smaller than our downstairs, like smaller than our living room small, but everything takes time. The adventure of having something worthwhile is never smooth and straight and our tiny house is definitely worthwhile. Sleeping quarters of two adults, one toddler, two cats and one dog. We make it work! In Phase 1: Understanding Your Stuff, we discussed how to discern the difference between items that we loved and items we just had lying around. In Phase 2, we are going to talk about how I pared down the items that I felt I had no use for in our tiny home. Remember, this is just a technique that I felt worked very well for me. You may find another way that suits you better and that is just fine. My recommendation for downsizing is thus: create a space that you can deposit items you don’t use and therefore start a garage sale pile. I designated our 2nd story loft for my such space. We haven’t used our 2nd story for a while now (more on that later) and it created the perfect zone to accumulate the stuff I wanted to sell. I would then break up the house into rooms, then divide the rooms into zones. For example, our bedroom has three zones; our clothes dresser, the closet and our daughters book box. These are the areas for us that easily accumulate outgrown clothes, old books and unused toys. Taking my time, I would slowly go through each zone and weed out the items that I wasn’t too fond of or stuff that we had outgrown. The key is to go slowly. You don’t want to become overwhelmed, which is VERY easy to do. I find that purging your material junk is easiest to manage if you start this months in advance. This definitely isn’t the time to procrastinate! Sifting through years of acquired stuff takes a lot of time. Personally, I am constantly having to go through boxes that I thought I had taken care of, only to find out that I don’t need three strainers or 5 sets of bed sheets. Go slow and after you’re done, enjoy the feeling of a lighter laundry load or finally being able to whip through the dishes in 5 minutes. You deserve it! Downsizing is no joke. J and I going from a 1,400 square foot condo to less than a 200 square foot tiny home….with a toddler, a 60 pound German Shepard and two cats who aren’t exactly fond of each other. While finding new homes for our animals is NOT an option, material junk is possible. Tikka, our Norwegian Forest Cat rescue. We started our downsizing journey long before we got serious about going tiny. One massive garage sale later, we had purged a huge amount of stuff and I had felt such an intense relief as it was carted off to its new home. It was such an intoxicating feeling. Fast forward to one year later and we’ve accumulated another garage sale sized pile of stuff that we realized we have no use for in a tiny home. Kitty, our Domestic Mix rescue. I feel like a lot of people shy away from tiny living, only for the fact that they feel like they are too attached to their personal belongings. You may be attached for a very good reason, like it was your great grandmas lace curtains or a trinket that signified a very special time in your life. I get it, because that’s how I was too. I had saved every single newborn outfit my daughter had worn, only because she is my first baby and those newborn outfits are so small and freaking adorable. After we decided to go tiny, I had to revisit those plastic tubs of carefully folded baby clothes. Did that deliciously small pair of footie pajamas that W wore only a few times define the 3-4 weeks of memories I had of her as a newborn? Heck no. As a soon to be tiny home dweller, I just needed to be able to differentiate between the items that meant A LOT to me, like the hand built kitchen table that J built for me and items that were insignificant, like the gazillion mixing bowls I had in my cupboard. Willie, our German Shepherd/Border Collie Rescue. Speaking of hand built kitchen tables, mine in absolutely magnificent, on top of huge and very heavy. There is absolutely no way that we could fit that in the tiny house. Logically, I’m supposed to detach myself from things, but when that thing took two weeks to build and a lot of cursing and sweat from my handy husband, I just couldn’t do it. It means too much to me. Luckily, we have some wonderful family members that have some storage space to spare and have graciously allowed us to store our table and chairs, along with my wedding dress and a few other items on their property. We want to keep stuff we save to a minimum though; going tiny doesn’t mean trying to hold onto that baby swing that your 2 year old hasn’t used for the last 10 months, just to try and save it for a potential 2nd baby years down the road. Living tiny was never an option for J and I when we first started dating. Growing up, we had the same mentality as our parents did; get married, buy a house and have children. We always assumed that we’d settle down in a 3-4 bedroom house with a decent sized yard, but only because that’s what our parents did. We never thought we had any other options until friends of ours built their tiny house. Before tiny house, we rented. We bounced between a 1 bedroom apartment to a 4 bedroom house we rented with my father-in-law to finally a 2 bedroom condo. That’s where we lived when we welcomed our daughter, along with the thousands of baby stuff that naturally accrues when anyone has a baby. As a stay at home mom, money was tight. We never got to a point of not being able to pay bills on time, but we had reached the point where we were working just to pay them. There wasn’t any money left over for saving for a down payment on a house, much less date nights (what’s that?!?!?!) or fun day trips to the beach. That’s when we decided to do something about it and change our lifestyle. Tiny living gives us the opportunity to save money, enough so we can eventually buy a solid foundation home, or if we want to continue to live tiny, the freedom to buy land and build a solid foundation home later on down the line. We can now take spontaneous trips to the snow or save enough money to send our daughter to college. 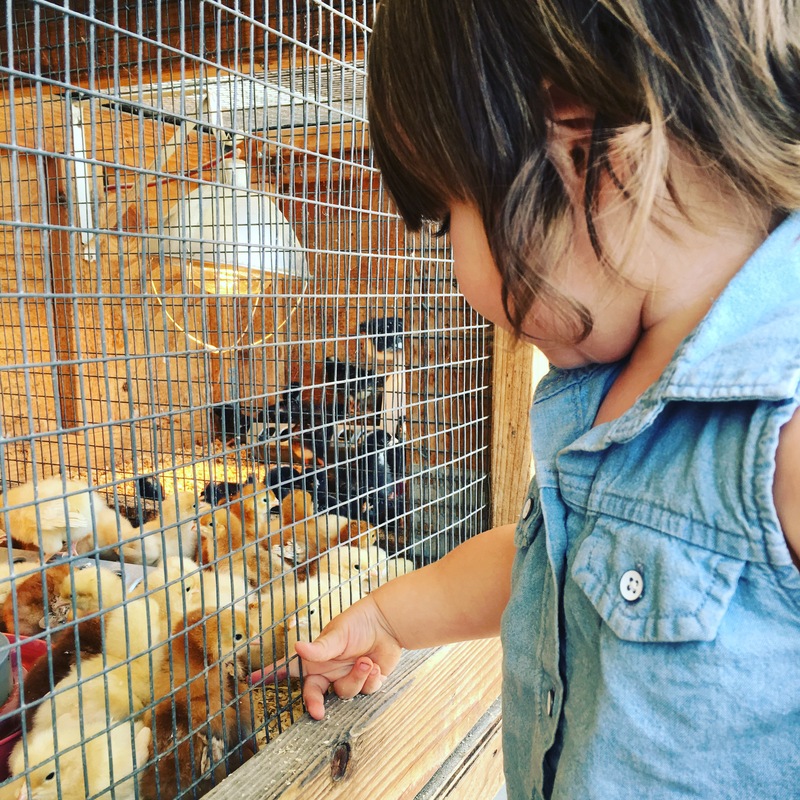 Tiny living gives us the chance to live a much more fulfilling life and I can’t wait to pass that mentality on down to my children.